It took a throwback performance from Tim Duncan in overtime to thwart the Oklahoma City Thunder on Saturday night, locking up the Western Conference for the Spurs. That extra frame evoked a bygone era, when the Big Fundamental banged and banked his team to four championships. Those dominant days may be gone, but at 38, Duncan was still able to muster enough energy to be the best player on the court during the most important five minutes of the season. But San Antonio can’t count on that from Duncan like it once did. The Spurs last won the NBA title seven years ago, when Duncan was 31 and still in his prime. This season, although the core faces look familiar, everything else is different; the Big Three are now backed by one of the deepest and most effective rosters in the league, enabling the team to both ration the minutes of its graying stars and also extend its reign among the league’s most elite franchises. “There are only so many bullets in a gun,” says R.C. Buford, referring to the looming expiration date of the Spurs’ most precious human resources. Buford has been the team’s general manager since 2002 and is largely responsible for assembling one of the most unique rosters ever to reach the NBA Finals. This year’s team may or may not end this season as champions, but the 2013-14 San Antonio Spurs will certainly go down as one of the most egalitarian teams in NBA history. You can see it in the way they move and share the ball; you can see it in the distribution of playing time up and down the bench. The clouds got dark early in this current playoff run. After a shocking Vince Carter buzzer-beater in Dallas, the Spurs suddenly found themselves down two games to one in a first-round series that wasn’t predicted to even be close. But the Spurs righted course and rallied to win three of the last four games to advance to face Portland in the Western Conference semifinals. 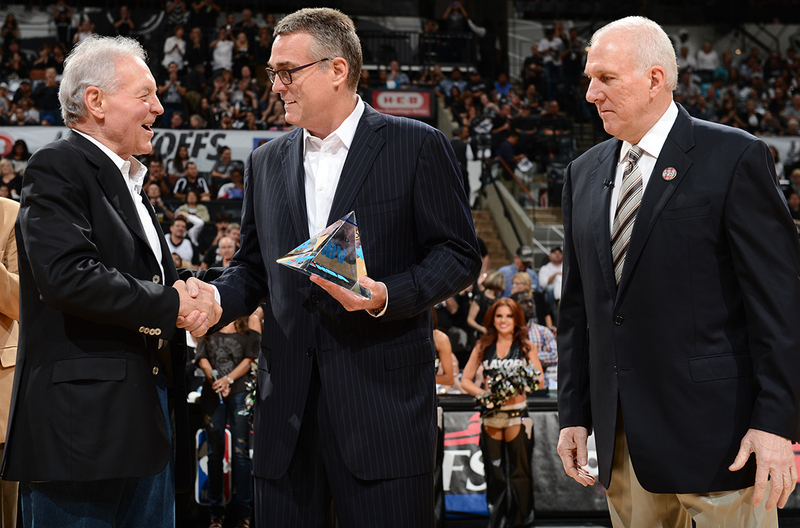 Before Game 2 of the Portland series, the Spurs held a brief ceremony at midcourt of the AT&T Center to honor Buford, who was named Executive of the Year just a day earlier. Spurs chairman and CEO Peter Holt handed Buford a big pyramidal glass trophy, and Popovich gave him an endearingly awkward hug. Although Buford has been lauded for years, it was somehow his first time winning the award, which is voted on by league executives and given annually to the best general manager. After winning the award, Buford flashed his typically wry sense of humor. RC Buford joked he won Exec of the Year because he's finally got enough former staffers in GM posts to stuff ballot box. While Popovich has a trio of Coach of the Year trophies, it’s hard to believe that Buford has only one of the executive awards. For years, the two have worked together to build the most stable and successful franchise in the league. Popovich and Buford have literally pioneered the way NBA teams discover and develop international talent, and in many ways their current roster, which is both incredibly deep and incredibly diverse, embodies the core principles of their partnership. The Spurs are so deep that their bench has a nickname. Local writers and fans refer to the team’s second unit as the “Foreign Legion” because of its international composition. The Legion, which features players from Australia, South America, Europe, and North America, led all NBA benches in both minutes and production this season. Although a few key members of the bench unit were acquired via free agency, Buford and the Spurs gradually built the majority of it using the draft, an impressive feat considering how late the Spurs have picked in the draft over the past 15 years. Regardless of the moniker, the Spurs’ bench unit is a major reason the team got the no. 1 seed in the West and has gotten past Dallas, Portland, and now Oklahoma City. The Foreign Legion outscored the Thunder bench 51 to five in the decisive game on Saturday night. Along with Duncan’s contributions, the cagey Frenchman Boris Diaw (26 points) and Manu Ginobili (15 points, six rebounds, five assists, and four steals) came off the bench and sparked the team past their ferociously hungry but fatally thin rivals. Only five players scored for the Thunder. Of the 10 players who scored for San Antonio, just three were born in the United States — and with Matt Bonner sliding into the starting lineup for Games 5 and 6, every single player on the Spurs bench but two (Jeff Ayres and Austin Daye) was foreign-born. This kind of breadth is not unusual for the Spurs, who have shared minutes at historic levels this year. The Spurs were the first team since the ABA-NBA merger in 1976 not to have a single player average more than 30 minutes per game. In other words, Popovich relies on his starters less and his bench more than anybody in decades. 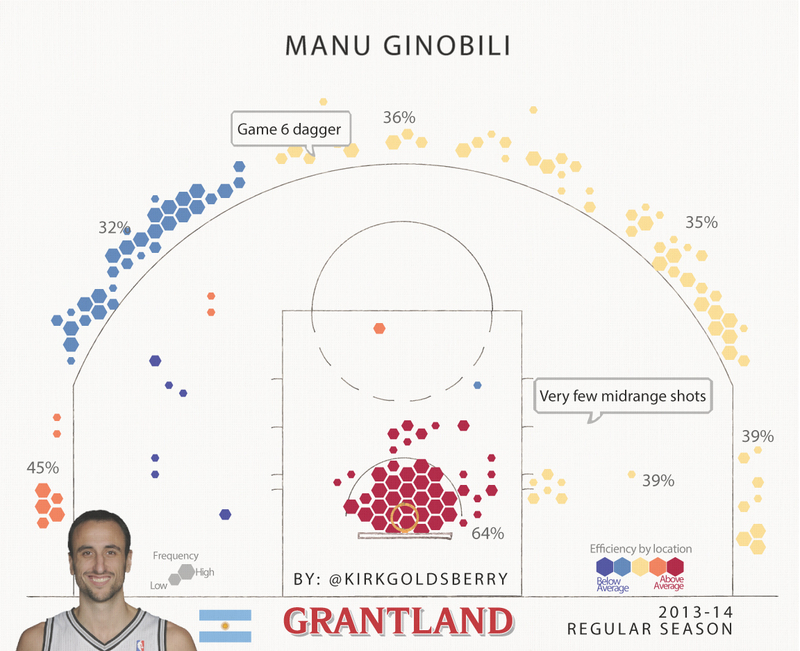 The unquestionable leader of that bench is Manu Ginobili, the slashing southpaw from Bahía Blanca, Argentina. The Spurs drafted Ginobili with the 57th pick of the 1999 NBA draft. Although no one knew it at the time, “Emanuel” Ginobili would go down as one of the best second-round picks ever. Emanuel quickly became Manu and won over the hearts and minds of Spurs fans with his brand of play, which foreshadowed the future of NBA play; he was James Harden before James Harden. Ginobili is an attack-minded slasher who loves 3s, rim attacks, and free throws; he hated midrange shots before it was cool to hate them. Oh, and he brought the NBA the Eurostep, which early on in his career was often called a travel by NBA officials who didn’t know what to make of Ginobili’s signature move. More than 12 years after that debut, 36-year-old Manu has Eurostepped his way to three rings and become one of the most iconic sixth men in league history. And he loves being a Swiss army knife. But Ginobili acknowledges that, at 36, it’s not as easy to hop off the bench and immediately provide that microwave flash like he used to. 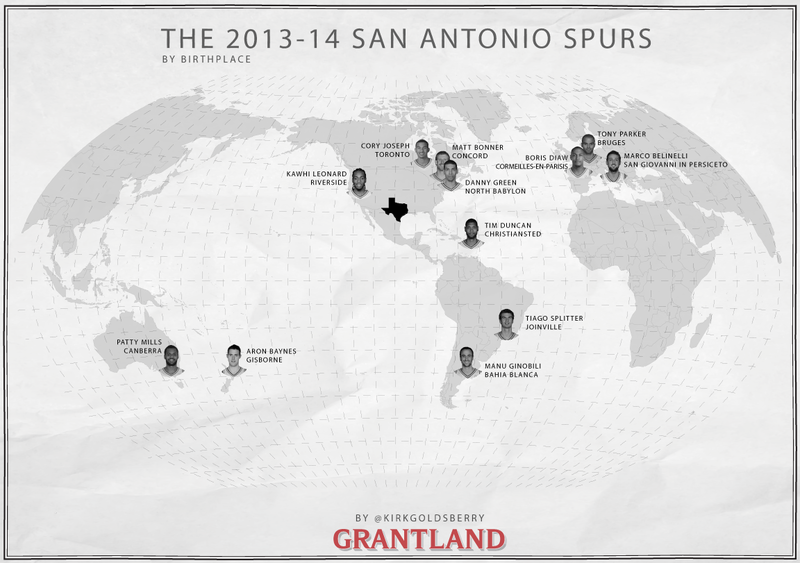 It may be a little different, but Ginobili is still essential in San Antonio. After Tony Parker re-aggravated his injured ankle in the third quarter on Saturday, Popovich called on Ginobili to replace him as the team’s primary point guard. No surprise, Ginobili answered the call, making perhaps one of the biggest shots of the Spurs’ current playoff run. The world got its first real look at Mills in the 2012 Summer Olympics in London, where he became a folk hero in Australia after hitting a huge buzzer-beating 3 to beat Russia, and also edged out Kevin Durant to become the tournament’s overall leading scorer. Despite that hero status in Australia, Mills struggled early in his NBA career. The Blazers selected him with the 55th pick in the 2009 NBA draft. After two up-and-down years in Portland, Mills left the NBA during the lockout and played back in Australia and in China during the 2011-12 season; the Spurs signed him in March 2012, and he has slowly worked his way from being a towel-waver at the end of the bench to one of the team’s key rotation guys. This year is the first in which Mills has emerged as a necessary piece in Popovich’s rotation. He has finally earned Pop’s trust. A couple of weeks ago, Parker left Game 5 of the Portland series with a hamstring injury in the second quarter and would not return. That night, it was Mills, not Ginobili, who filled Parker’s void, scoring 18 points in 26 minutes and helping the Spurs blow out the Blazers 104-82; the Spurs bench outscored the Blazers 220 to 77 for the series. While Popovich and Buford both got trophies for their hard work this season, they had some help behind the scenes, and Buford suggests that the team’s developmental coaches, Engelland and Chad Forcier, deserve a lot of the credit. They are the guys who improve the jump shots and fix the free throws. They spend hundreds of hours with each player, fine-tuning their game and making sure they’re ready to contribute when needed. This developmental philosophy is a cornerstone of the Spurs organization, and it’s certainly nothing new; Buford suggests it dates back to 2002, when the team hired Brett Brown (now the Sixers head coach) to direct player development. Brown would work hard to make sure that all the bench players were constantly working out and conditioning, so they’d be ready if their numbers were called. It didn’t take long to cash in those dividends. In Game 6 of the 2003 Western Conference finals, the Spurs called on Steve Kerr, who barely played in any of the previous playoff games that season. Kerr made four 3s in an insane fourth-quarter run that flipped the series back to the Spurs and help propel the team to its second championship. Buford emphasizes that Engelland and Forcier are filling Brown’s role now, keeping bench guys ready to play regardless of slumps or trends in minutes. After averaging only three points per game in Round 1 against Dallas, Belinelli came back and averaged more than three times that against Portland. Now he’s playing in the NBA Finals for the first time. The 28-year-old Italian guard, who has played for five different NBA franchises, says the Spurs are the most professional organization he’s been around. He has also been one of their developmental team’s biggest success stories this year. This season, he set career marks in shooting percentage, made 3s, and free throw percentage. He showcased that improved shot in February in New Orleans, winning the 3-point shooting contest at All-Star Weekend. But Belinelli is quick to point out that having Ginobili around is particularly helpful. The Spurs bench not only led the league in points and production — unsurprisingly, it also was first in assists. According to player tracking data, the Spurs passed the ball more than any other team in the league this season — both the starters and the bench guys play with those principles of sharing. Diaw fits that description quite well himself. Next to Ginobili, the 31-year-old Frenchman has become one of the keys to the Foreign Legion’s success. Although he has bounced around the NBA for years, it appears that Diaw has found a home in San Antonio, where his game fits right in and he can play alongside his good friend Tony Parker. Many remember Diaw from his days as a starter on the 7 Seconds or Less Phoenix Suns. But that was eight years ago, and although Diaw performed well back then, he was only 23. His game has transformed in San Antonio, where the Spurs take advantage of his versatility to cause matchup nightmares on a regular basis. Saturday’s win in Oklahoma City may have been Diaw’s best performance ever, and that versatility was front and center. Just over two years after being waived by the Charlotte Bobcats, Diaw led the Spurs with 26 huge points. His fantastic game provided a microcosm of the wily 10-year vet’s versatility; his points came from beyond the arc, deep in the paint, and at the line. He made three 3s, five shots in the restricted area, and seven free throws. 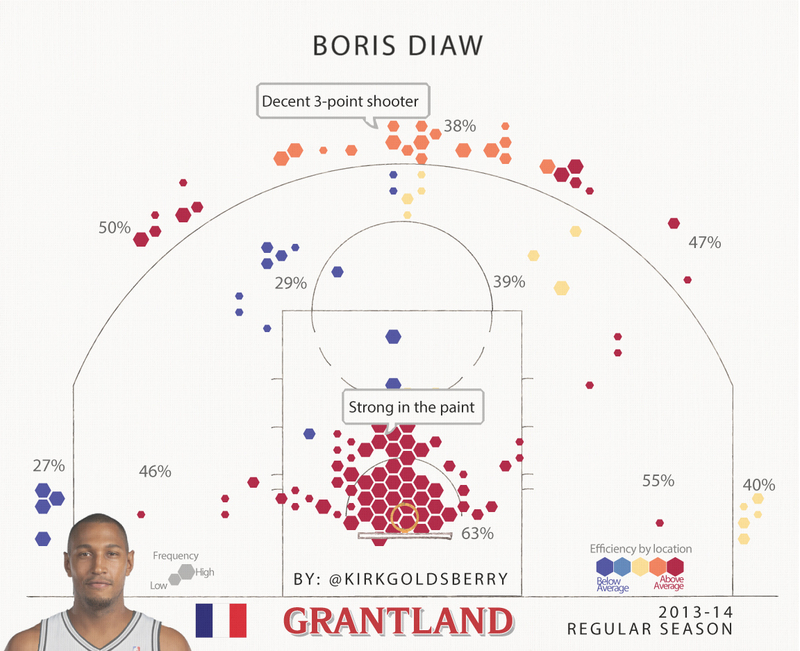 As a forward, Diaw is a good enough shooter to lure imposing bigs like Serge Ibaka out of the paint, but he also has a slew of crafty low-post moves that he can use to punish smaller players around the basket after switches. He did it all on Saturday when the team desperately needed someone to step up. Diaw and Ginobili not only helped the Spurs get over the Thunder; they are setting an example for a bench full of younger guys in the process. On many teams, bench players view playing time as the ultimate currency, as the chance to showcase their wares to one day crack the starting lineup. But the culture in San Antonio is different, and young players like Cory Joseph, Aron Baynes, Jeff Ayres, and Austin Daye are all watching their older benchmates get to be difference-makers deep in the playoffs. It further instills the idea that you don’t have to be an American superstar to become an NBA champion — especially in San Antonio. In a time when individual basketball players are marketed as brands, this Spurs franchise is built upon an antithetical architecture; according to Buford, the Spurs’ style of play “is the cultural byproduct of our development focus,” which aims to not only maximize the output and opportunities of the team’s aging star players, but also to curate the cooperative talents of its role players. It’s a symbiotic pair of core philosophies that not only preserves Duncan’s knees and Parker’s ankles, but also serves to train their understudies. Although it’s probably unfair to say the Spurs “stumbled” into their deep-minded bench resources, their unusual circumstances have allowed for a new kind of NBA roster. The core includes three worn and weathered champions with just a few bullets left in their revolvers. But thanks to their strong international supporting cast, what few they have left will be on display over the next two weeks.